Walk down the stairs from East China Trading Company and pass through the velvet curtains and you are transported into the romance, mystery and decadence of the new look Golden Monkey. Part opium den, part Shanghai 1920s nightspot, Golden Monkey provides the ultimate hedonistic escape. A beautifully hand-painted billboard with a reclining temptress sets the cinematic mood to the place, and the maze of wooden screens provides the perfect balance of privacy and openness where you can choose to watch or be watched. The old world feel of the venue is contrasted by a modern lighting design that reflects the Shanghai of today where the old blends seamlessly into the new. 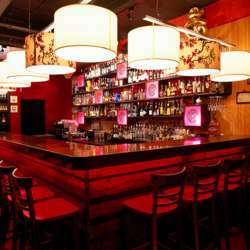 Golden Monkey is all about fine drinks and fun times. You can hang around at the bar, lay back in a booth or sway to the good vibes. The drinks are designed for a night out with friends with refreshingly good cocktails, house made specialty shots and shared punches served in everything from traditional Chinese steamboats to vintage metal trunks. Complimenting the drinks list are signature handmade steamed dumplings and fluffy traditional Chinese bao available all night long. Favourites such as Har Gao, Siu Mai, Xiao Long Bao and Shui Jiao come fresh, hot and steaming in big bamboo baskets right to the table. The soundtrack is a mix of lounge and electronica to take you on a journey to another time and place.